• Version used for the screen captures: WS.WebTV Professional 1.2.0.1 (all extensions enabled). Some options/features might be different, respect your WebTV, depending on the installed version and extensions you have purchased. 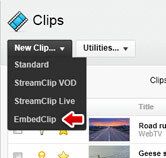 An EmbedClip is a special type of Clip that, instead of linking to video files, it stores an embed code. Generic Embed Mode: When an embed code (HTML) is supplied, the WS.WebTV video player will get replaced by the embed code (at playback time). From this tab you will be able to enter the corresponding embed codes. » Vimeo, Dailymotion or Metacafe: Simply enter the URL of the desired video, into the Flash and HTML5 slots. » YouTube (WS.WebTV 1.4.0.3-1.7.0): Enter the URL of the desired video, into the Flash and HTML5 slots. 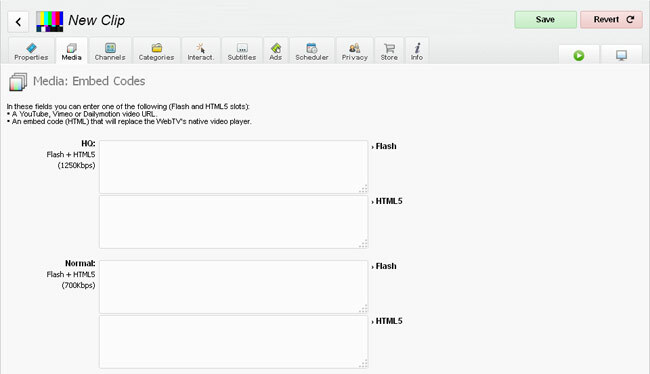 » YouTube (WS.WebTV 1.7.5+): Enter the URL of the desired video, with the [embed] prefix, into the Flash and HTML5 slots. Example: [embed]https://www.youtube.com/watch?v=XUR1IoPdBg8 (if you don't use the [embed] prefix, the WebTV will playback the video with the WebTV video player), more info here. Why do you need to enter the code twice? Because the code corresponding to "Flash" will be used by the Flash video player and the code entered for "HTML5" will be used by the HTML5 video player. This is useful when you need to provide different codes depending on the playback technology. If you just have one embed code, the enter the same embed code into Flash and HTML5 fields. My embed code contains <script> tags: Will it work? Advanced usage (only for Classic/Default Theme): Using different embed codes on "Desktop" and "Mobile" interfaces (when not using "Easy Embedding"). Since (when using the Classic/Default visual Ttheme) the size of the WebTV page is different in the "Desktop" and "Mobile" interfaces (and the embed code is not resized automatically), you may want to use different sized embed codes, one for the "Desktop" interface and another, smaller ( 320px or 100% width), for the "Mobile" one. NOTE: As explained before, you must supply the embed code for Flash and HTML5 fields (both). So, in the case of the previous example, the same code block must be entered into both fields. - Interactivities / PlayerLogo: These features will only work when using direct YouTube Playback. - "Direct YouTube playback" is supported on Flash, through the YouTube Chromeless player and on HTML5 through the YouTube Iframe API. Note regarding playlists on HTML5: On desktop PCs, YouTube videos will play continuously; however, on mobile devices a user interaction is required in order to continue the playback. This is a limitation imposed by mobile browsers not by WS.WebTV. "Direct YouTube playback" functionality is subject to the terms (and will...) of YouTube. WebTV Solutions is not related in any way with YouTube and does not guarantee this functionality.